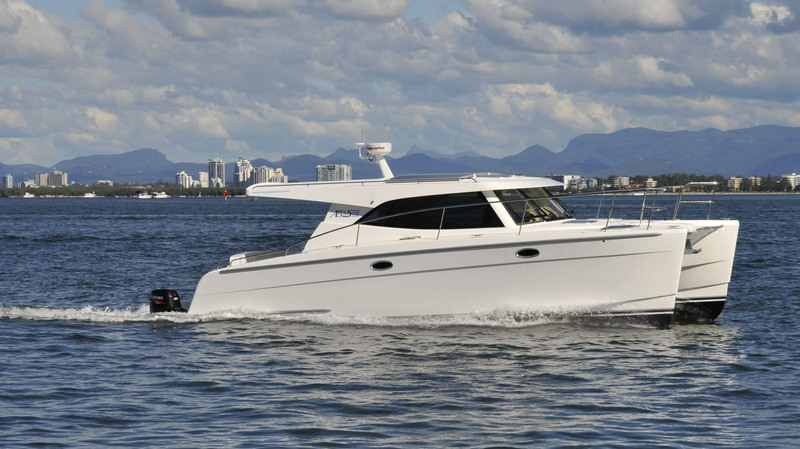 With comfortable accommodation, fast cruising performance, low runing costs and a great look, this is the power boat that many have been waiting for. Introducing a coastal cruising boat that makes sense for our times. The Argus E35 is at home in the Australian coastal environment with a vast array of reef, island, estuary and river destinations to explore. At 10.2 metre waterline length, the displacement hull technology provides an extraordinary smooth ride. Even in the type of rough conditions like the infamous Moreton Bay chop a tunnel clearance of 0.7 metres means that most waves will simply pass under. The bow with narrow hulls and a deep forefoot rises slowly to the chop so the boat slices through the waves rather than bouncing over them. 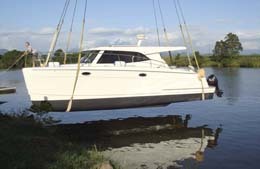 A large reserve buoyancy in the asymmetrical bow carries the boat over the bigger stuff. The occasional high standing wave is softened by the new wave breaker nacelle. 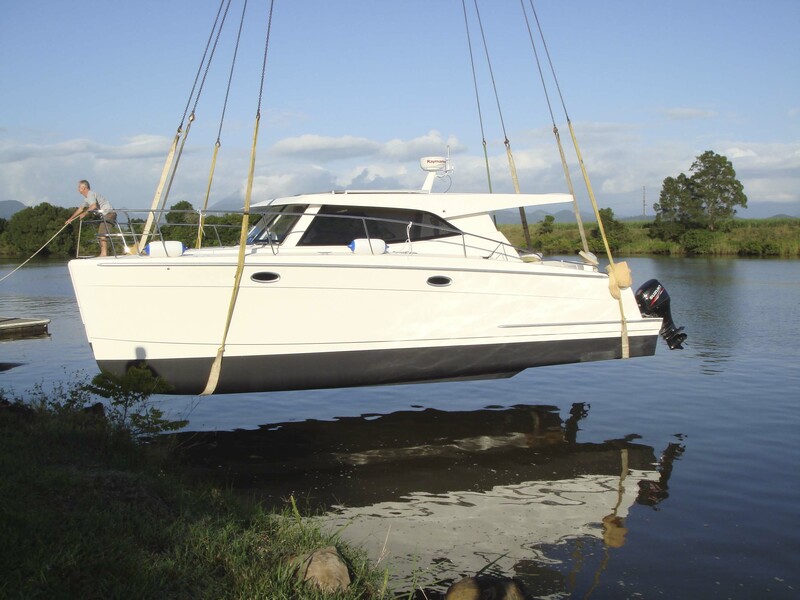 This means that the boat can maintain a substantial cruising speed when caught out in nasty conditions. By increasing crew comfort and maintaining a higher cruise speed, the ability to weather the unexpected is an important safety feature. With a draft of only 0.6 metres shallow water access couldn't be easier. The catamaran hull ensures a level platform for drying out on sandy tidal flats. 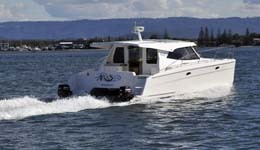 The sedan version has an above waterline clearance of 2.9 metres (plus radar mast) which means that the majority of canal and river bridges can be undertaken without waiting for low tide. The capability of exploring river systems dramatically expands waterway access and anchorage opportunities. 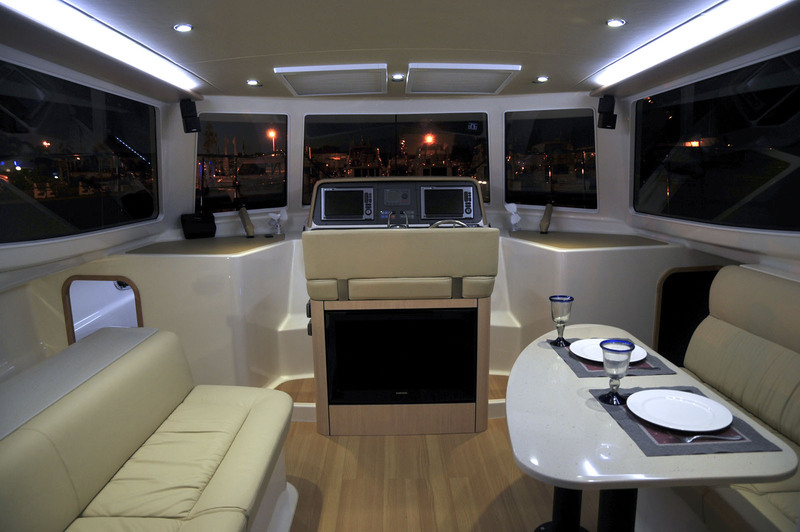 The helm features an elevated seating arrangement for two that provides a commanding view. Two hatches are strategically placed overhead to allow a standing position on the helm seat for an even better perspective of the surrounding area. Huge workspaces either side of the helm are perfect for charts or a laptop. Electric opening outer glass screens provide good ventilation. A cruise speed range of 6 to 16 knots gives incredible flexibility in range and time to destination. At 8 knots the fuel consumption of 1 litre per nautical mile gives a range approaching 600 miles in favorable sea conditions. A direct run from the Gold Coast to Sydney (400 nautical miles) or even Brisbane to Mackay (500 nautical mile) is now possible on less than 600 litres of fuel. 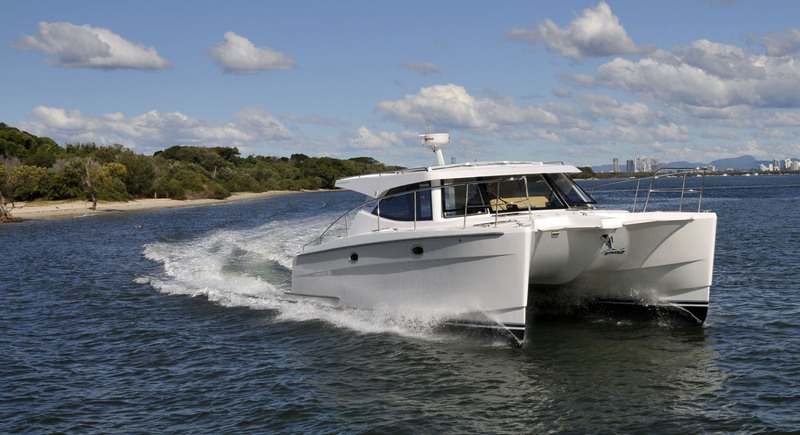 The boat cruises comfortably at 16 knots while returning a fuel consumption of around 1.5 litres per nautical mile. The range is about 400 miles at this speed. The data shown below was taken from the vessel #1 in calm conditions with no influence of current. The optional inboard diesel version should return even better economy and range figures. The outstanding economy achieved by the design is evidenced by the minimum water disturbance. 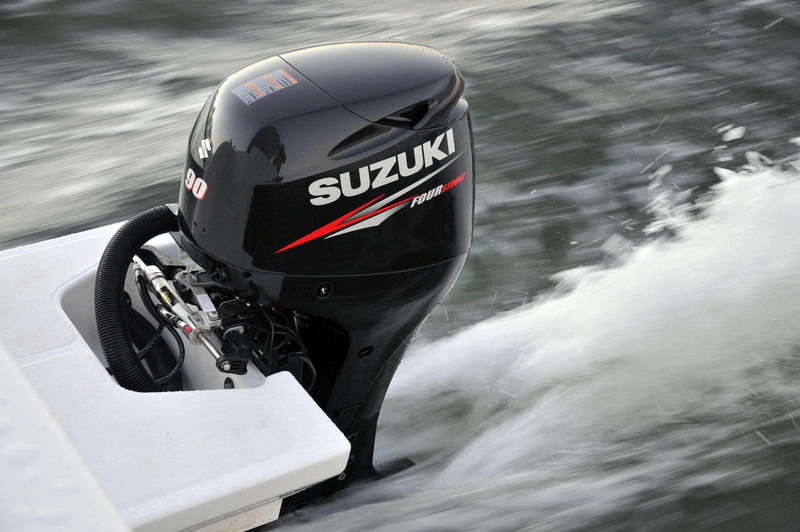 With less drag, a higher proportion of engine power goes into driving the boat forward rather than generating a huge wake. This means that lower horsepower engines can easily achieve the designed hull speed. The relatively small wake does little to disturb boats at anchor or smaller vessels under way. 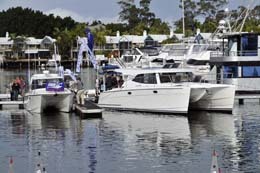 I's a vessel that pays respect to fellow boaters, the foreshore and the environment. 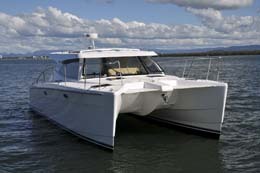 The Argus E35 presents the unique combination of cruising ability for the voyage and outstanding comfort at anchor. The emphasis has been placed on live aboard comfort for fewer people rather than cramming additional sleeping cabins and heads. As an entertainment platform the E35 shines to host your friends and fellow cruisers. 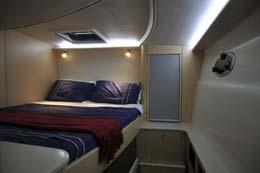 Two generous sleeping cabins feature queen size bedding, ample storage and flow through ventilation. A single head to starboard is spacious. The large galley has over two metres of bench space and is complete with induction electric cooktops, microwave oven and refrigerator. The saloon has a large, bright and airy feel. It will comfortably seat 8 people for a social get together and is extremely spacious for four. The aft deck is large with room for a table and chairs to seat 8 people or can easily handle up to six for fishing. The vessel is not short on headroom either with 2050 mm (6' 6") in the saloon and 1850 mm (6' 1") in the hulls. The on board systems are engineered to be quiet and hassle free. 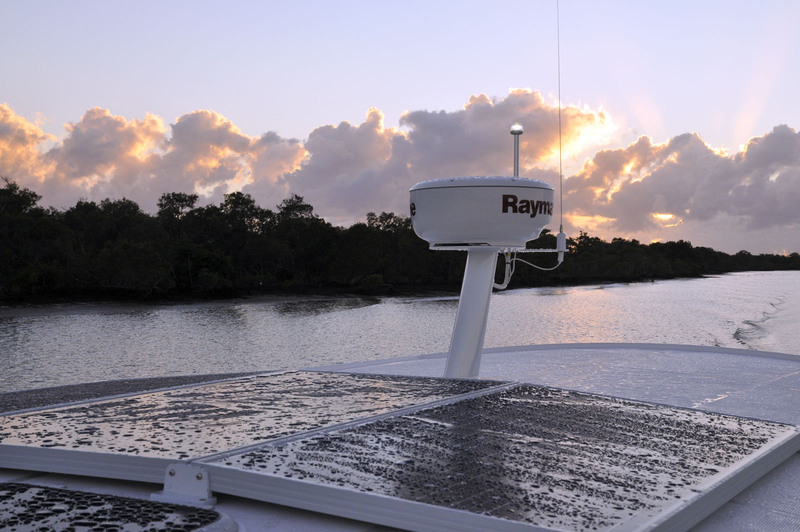 Just over 500 watts of solar panels on the roof provide the main electrical power for the vessel. In conjunction with energy efficient appliances (for example the refrigeration enclosures are fitted with thick Dow Corning foam) there is no need to run a generator. The hot water system is heated "for free" using waste heat from the refrigeration system. 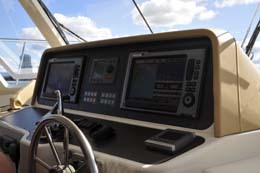 The standard electronics package includes a Raymarine autopilot, 12" colour chart plotter, radar, fish finder, NMEA-2000 instrumentation, AIS, VHF radio and electronic engine controls. Vessel electrics and systems are managed by a state of the art Empirbus computerised wiring and control system that helps turn operation of the vessel into an easy and fun experience for all. All of this means that the standard boat is engineered ready to go cruising in comfort right from the start with no hidden extras. 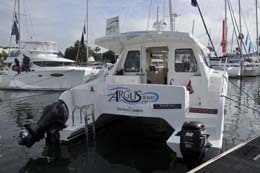 May 19th 2011 was the official release date of the Argus E35 at the Sanctuary Cove International Boat Show. Argus Boats thanks all of our visitors for their visit and feedback. 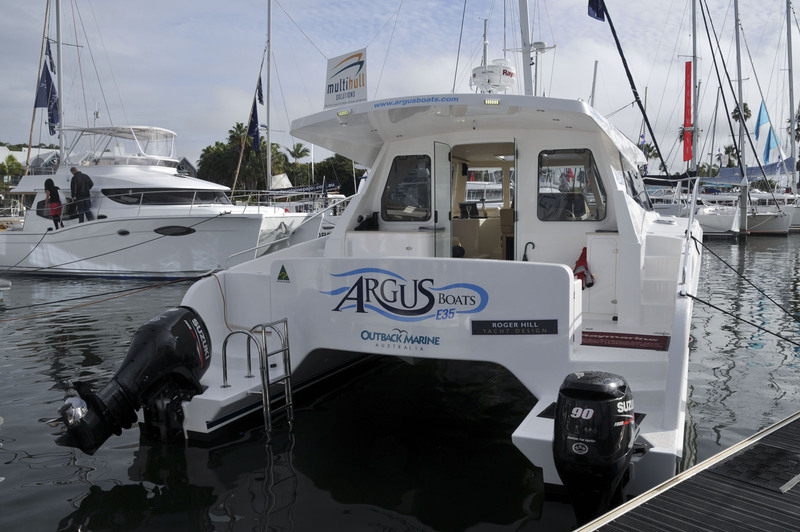 Outback Marine released the first Argus E35 at the Sanctuary Cove International Boat Show. The vessel is based in Brisbane and is available for viewing. Production orders are now being accepted. All specifications and features are subject to change without notice. The actual supplied vessel specification is determined by written contract. Any referred performance data is provided as a guideline and is not intended as a performance specification.